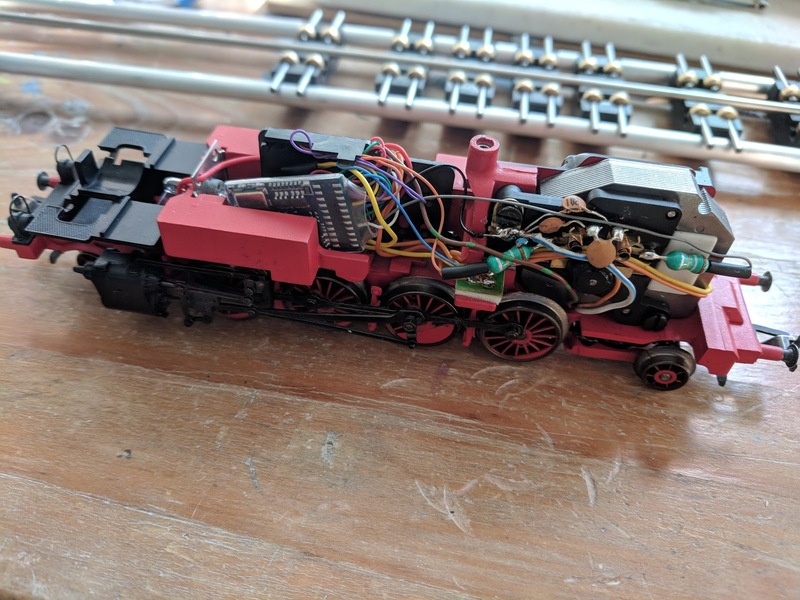 My very first digital Maerklin locomotive was a BR86 from a starter set. This model is known to have problems with power pickup, and sounding like it's grinding up its gears. Part of the issue here is the very low-end MM2 decoder built into these locomotives. Nevertheless, I lived with it for the last 10 years, but the locomotive got less and less use as other, cooler locomotives arrived on the Welztalbahn or were converted from analog. 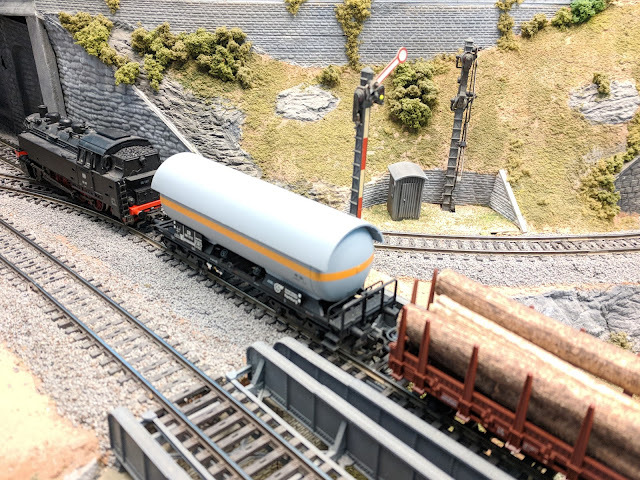 When switching a local freight this afternoon, I got fed up about the noise and crappy driving habits of this locomotive and brought it to the work bench. The axles got some more oil, the gears some grease, and it ran a little bit quieter, but not a lot. Alright, I do have a couple spare LokPilot 3.0 sitting on a shelf. Today's the day! 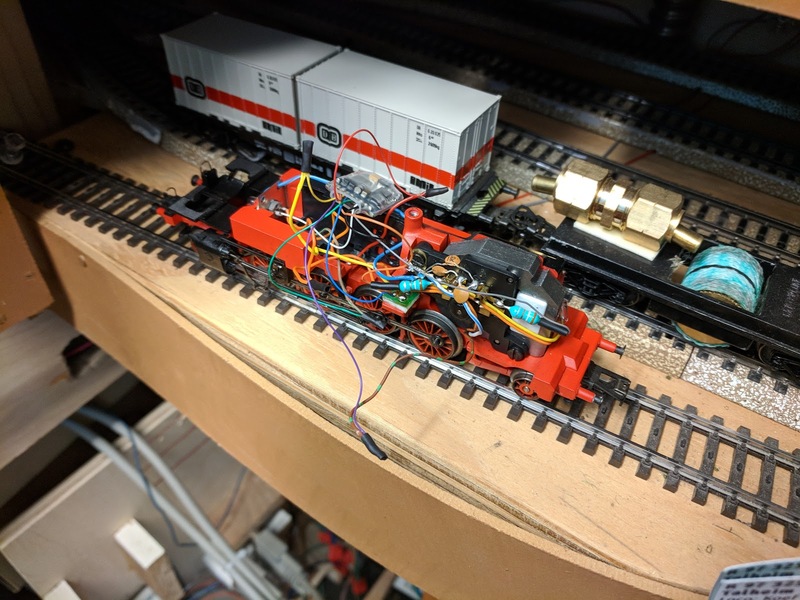 The old MM2 decoder made way for a Lokpilot, I connected power pickup and motor leads to see if this truly makes a difference... and what a difference it makes! The drivetrain no longer aches and croaks, but purrs like a kitten. I connected lights and Telex couplers. It all works. Off to the programming track we go. Next, I spent a considerable amount of time debugging the bad power pickup. 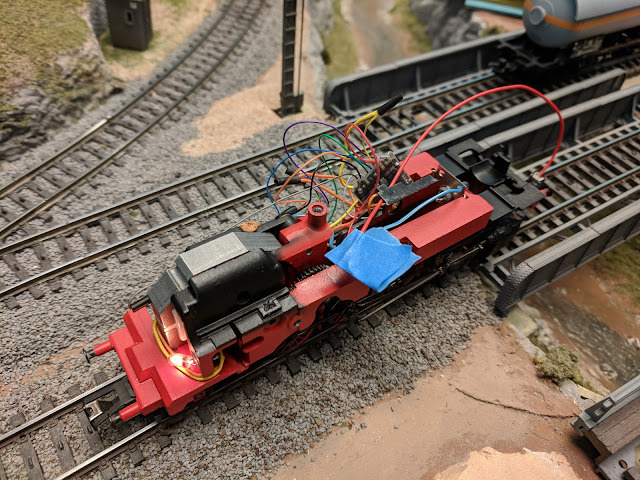 It's not the (known) bad power pick up from the outside rails, which I fixed soon after I got the locomotive by soldering cables between the spring that keeps the pilot trucks on the rails and the ground connector inside the locomotive. 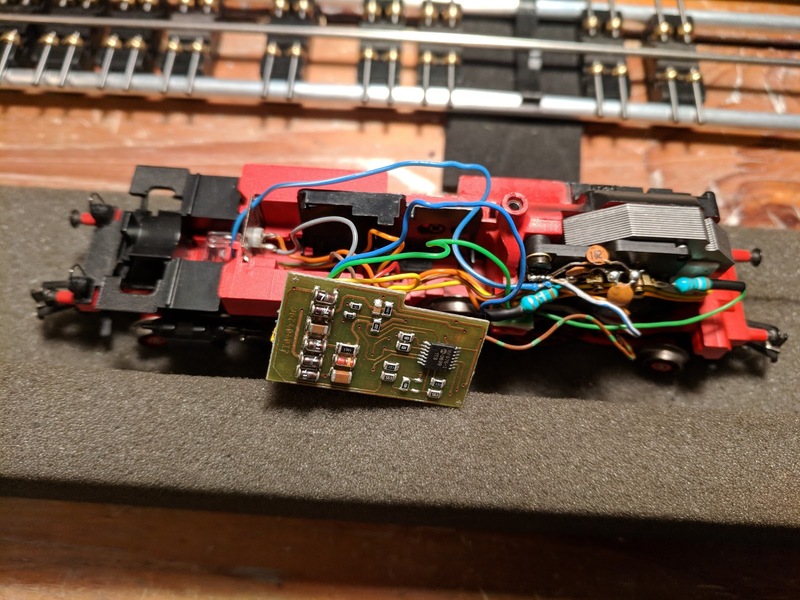 It appears the pick-up shoe has trouble maintaining healthy contact with the center rail studs, and/or passing the current to the decoder. As a test I soldered a wire to the pick-up shoe base and fed it directly to the decoder. That worked a bit better than using the contact at the bottom of the locomotive. I went even as far as routing the cable through the innards of the locomotive to the decoder bay and connecting it to the red cable feeding into the decoder. When test driving the locomotive across the layout, however, it reliably stalled on the inside curve of curved turnouts and caused shorts because the pick-up shoe made contact between the center stud contacts and the inside rail of the outer curve. In the end what did make a difference was installing a replacement pick-up shoe. Supposedly, a Roco "silent" pick-up shoe should work even better. Unfortunately, the grinding sound problem came back as well, not as bad as it used to be, but it looks like I will need to do some more tuning with the Lokpilot motor control settings to try and get this under control. For now, 86 167 is back in service on the afternoon local from Emsingen pulling cars for Prechtal into staging.